Today was a significant day in our home. In our church we have a semi-annual conference that is broadcast throughout the world, so we watch it in our home through video streaming. Because this is such a special time for us, we have developed certain traditions, kinda like a holiday. 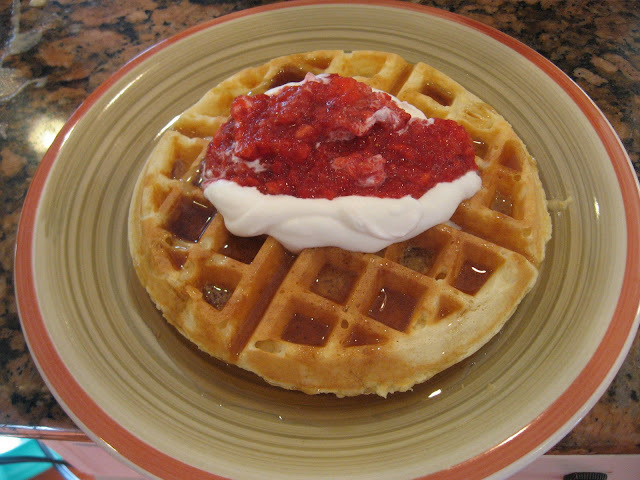 We look forward to it every six months, one of which is that I make Belgian Waffles with real whipped cream and strawberries. I thought I would share them with you as they are truly worth the effort! If there is a flaw with this recipe, I would have to say it would be that there is never enough. There are always people begging for more. I'm learning to double it up. So, let's carry on, shall we? Directions: Sprinkle yeast over warm milk. Stir to dissolve. Beat egg yolks and add to yeast mix with vanilla. Sift together flour, salt, and sugar. Add to liquid ing. Stir in melted butter and combine thoroughly. Beat egg whites till stiff peaks form. Carefully fold into batter. Let mix stand in warm place 45 minutes or until mix doubles in bulk. Use approx. 1/2-3/4 C batter per waffle. May vary w/ waffle griddle. Enjoy! Let me know if you try them, and tell me, what do you eat on your waffles? Hope you have had a happy Sabbath Day! They look yummy!Real whipped cream and strawberries, well how could you go wrong with that?